A mug of mid-morning coffee is definitely one of my daily pleasures. Proper coffee from the filter machine, fairly strong with a dash of milk, no sugar. Ahh, that’s better. Oh, and some toast. To keep me going until lunchtime. 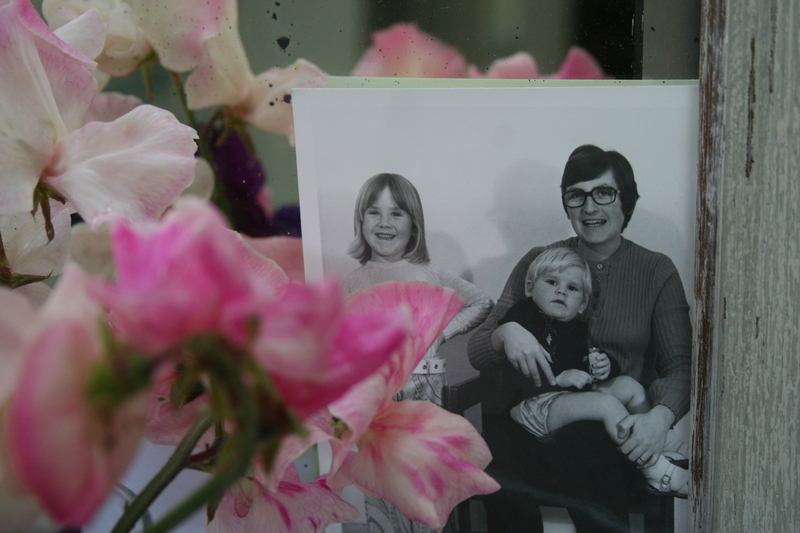 This is a photo of me on the left, my mum with my brother. You can see that he wasn’t too keen on having his photo taken. I’ve often wondered what my mum was saying… My dad was the photographer. I was about 6 and my brother about 2, so it was taken in the early 1970s. This is one of a very few photos I have from my childhood – it’s tucked it in a mirror frame and it makes me smile when I look at it. And the sweetpeas – I am especially fond of these sweetpeas from our garden that fill the room with their delicious scent. It’s such a treat to be able to go out to the garden and cut them every few days. 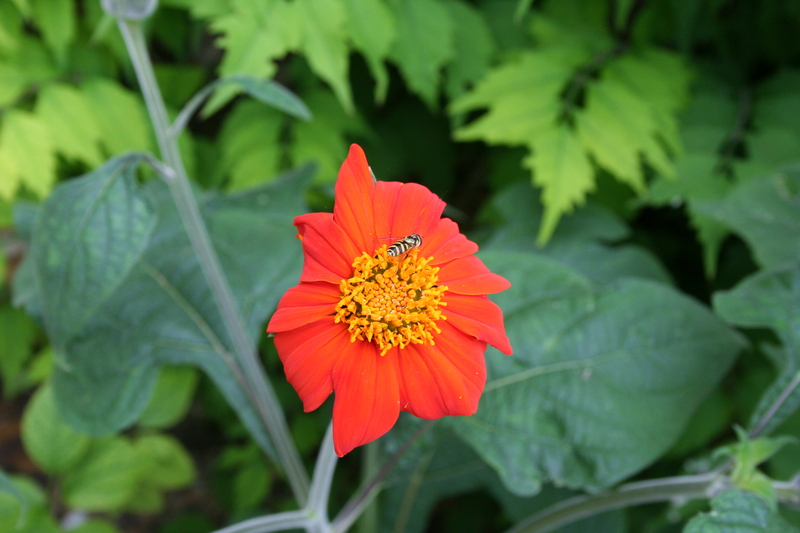 The Tithonia has started to bloom. The colour is completely stand-out and looks fabulous with the large, dark-green leaves. I’m really delighted with these plants as I raised them from seed sown in March. They are about 1m tall and stand proudly at the back of the border. The flowers are good for pollinating insects – I managed to snap this one with a hoverfly on it. Our tomatoes are ripening. We have eight plants of two cherry varieties – Sungold and Gardener’s Delight – and they’ve grown very tall with lots of fruiting trusses. There’s nothing quite like the taste of a home-grown tomato fresh from the vine but I suspect we might be sick of tomatoes by the end of the summer. Do you remember the pot-bound agapanthus that we cut into quarters and planted in the border? Well, here it is. It survived the hatchet-job and is flowering. There are only two flowers so far but that’s better than none and suggests it’s not too cross, thank goodness. The achilleas are still going strong. I can’t remember the name of this variety but it’s a gorgeous, cheery colour. Finally, here’s Cassie, worn-out after a good, long walk this morning. She’s usually curled up like a cat on this chair because she’s too long-legged to stretch out on it properly. Oops. I’m supposed to be working on something… Back to it! Oh well done with the agapanthus, that’s great news! Have a good weekend. Thank you Nicole. You too. Lovely to hear from you. On well done with the tithonias. I grew them last year, they are gorgeous. 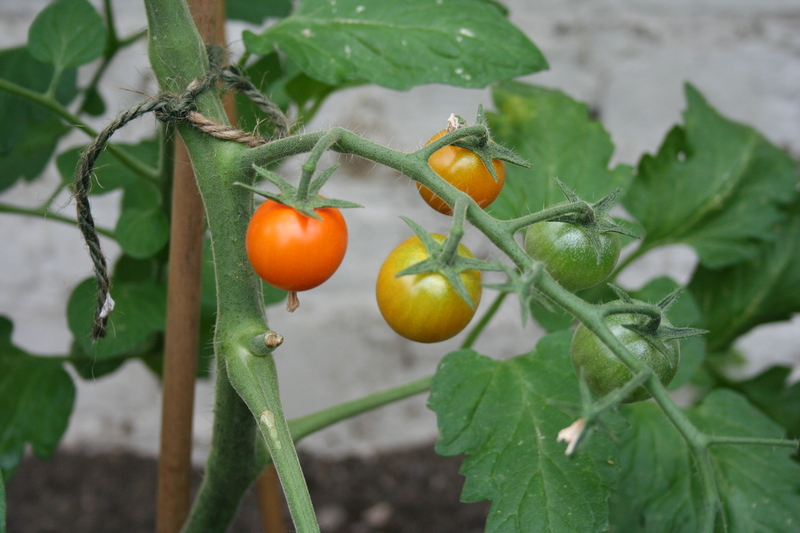 Do you grow your tomatoes outside? I have given up on outside ones because of blight. I envy you yours, nothing like them fresh and sun- warmed. We have four plants growing outside and four in the greenhouse. The plants in the greenhouse are taller and have more trusses but the ones outside are doing ok so far… Yes, tithonias are gorgeous aren’t they?! Oh Tithonia, very Sarah Ravenesque! I must look out for some seed. 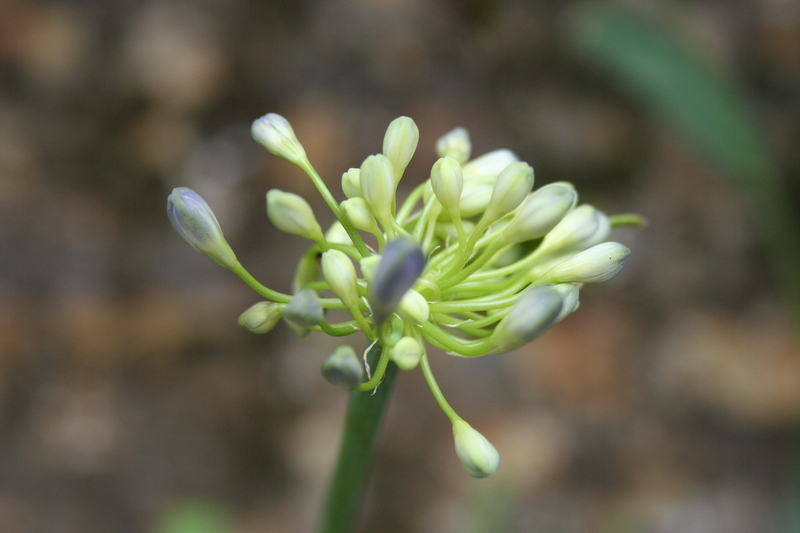 Excellent news on the agapanthus. Lovely black and white photo too, these old photos, uncropped, unedited and probably only one or two shots taken really do tell the whole story. (Interesting conversation on Front Row this week with a pioneering female photographer talking about her craft.) Fingers crossed it’s a blight-free year! Sorry Sam, it was Friday’s Woman’s Hour (I jump around between iplayer and live radio I get confused) and the photographer was Shirley Baker. The exhibition is on now at the photographers gallery. Thanks Sarah. I missed that one, so I’ll check it out. Goodness, so much and many have blossomed. I have TimeMachine running and it has allowed me to retrieve 2-year-old files for clients and revert to a previous computer state when I loaded some software that adversely affected another piece of software – very useful. I wish I had known about the USB plug in the past. Have fun! I was hugely relieved when David managed to retrieve the data, that’s for sure. I’ll look in to TimeMachine. Thanks for that. Hope all’s well with you Luise and you have a great summer. Love the old family photo. Tithonias are my favorite annual. Fantastic for butterflies, bees, and even hummingbirds. Plus you can’t beat the color. That achillea is a gorgeous colour! I planted one in my veg patch as I read they were good for bees but it’s huge! I’m hoping it will survive a move to another part of the garden in the winter. Tithonia from seed seems a good idea although I find the Raven’s catalogues a bit too tempting and pricey! The Sarah Raven catalogue is very lovely and tempting! 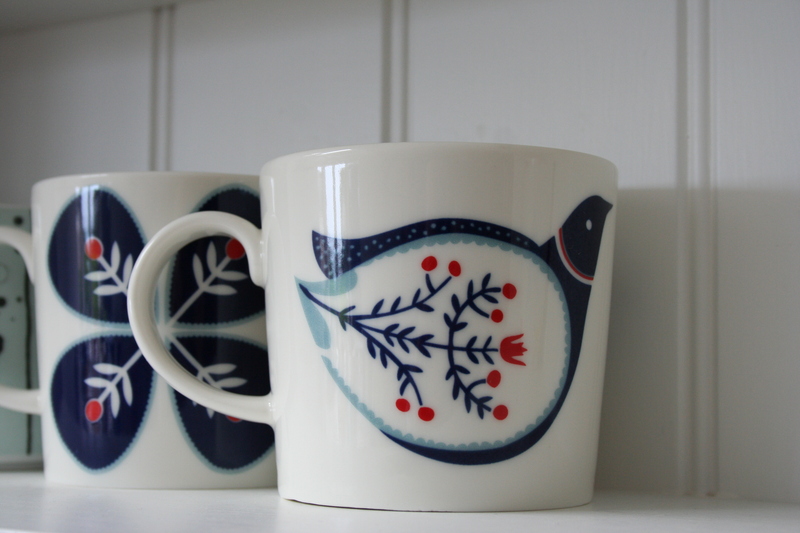 I’ve signed up for the online newsletter and there are some discounts to be had. I try to limit myself to a few packets of bulbs and seeds every now and then and they’ve always come good, so I reckon that justifies the expense. 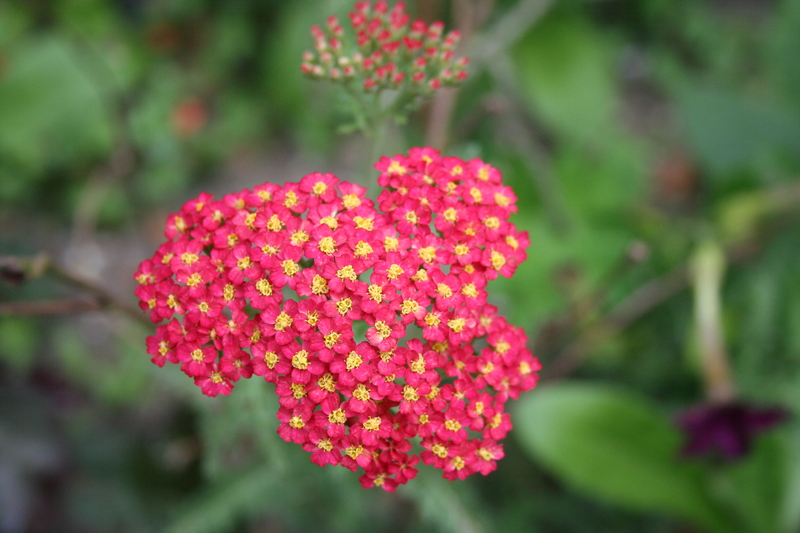 I bought 3 of these red achillea at a knock-down price last summer as they were very tatty. We grew them on and divided them in the spring – there are now approx 8 plants from the original 3 doing really well. I think it’s a fairly hardy plant so yours should be fine. Good luck. I think that they are Achillea ‘Paprika’. I am averting my eyes from this post to avoid unseemly outbursts of Agapanthus rage. Ha ha Alice. ‘Paprika’ rings a bell. Thanks. I absolutely love the tithonia! What an extraordinary colour. And I am impressed by how far on your tomatoes are. Ours are a couple of weeks away from ripening. Lovely childhood photo too. I have some marvellous ones from my childhood. Perhaps I should take them out of the drawer! We were told by the dog trust that she’s part greyhound, part Staffie. 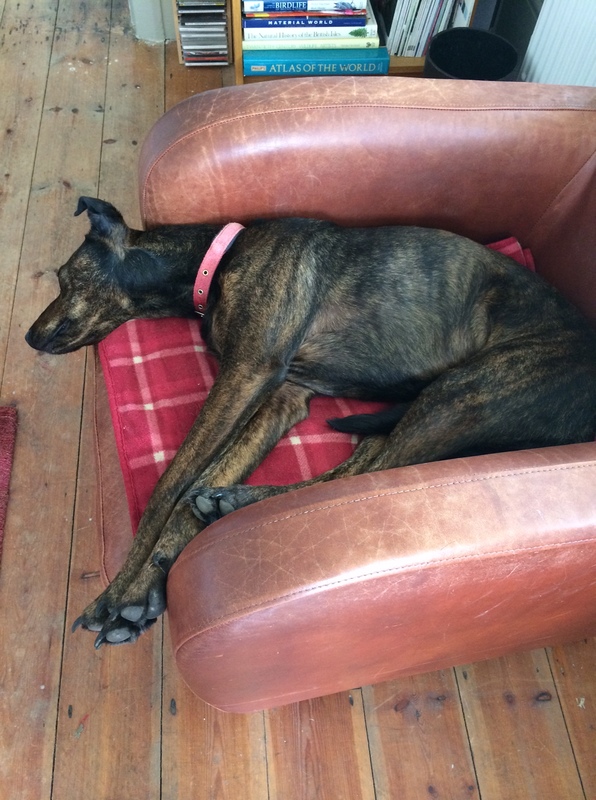 She’s bigger than a whippet but smaller than a greyhound and has the most gorgeous nature.